Any wash of ferries, changes of wind direction, any swell entering the bay, gusts, etc. will be cushioned by the catenary curve of the anchor chain which will keep the yacht clear of the quay: berthing along side won't protect the yacht. In the Mediterranean - especially in Greece - berthing along side is often hampered by blocks of ballasting near the quay. No neighbouring crews walking on your deck greatly adds to your privacy, especially so if bows-to. Some islands in the Mediterranean are home to rats, cockroaches, etc. Mediterranean mooring (with the gangway raised from the quay! ) helps to prevent vermin getting on board. It is much easier to leave a (crowded) port. No skipper likes to be the innermost yacht - four yachts thick - in an along side mooring situation. As the bow anchor typically offers more holding power and a longer (heavier) anchor chain it is very useful to become an expert in the stern-to variant of berthing Mediterranean-style. Position the bow the full length of your anchor chain away, or otherwise as far as possible, ready to drop anchor. In a crosswind go a little upwind since by the time the anchor touches seabed you will have drifted out of position. Drop anchor in front of the spot on the quay you are aiming for. Note, that anchoring NOT perpendicular to the quay (as people often do in a crosswind), could well mean crossing and potentially fouling the anchor lines of your neighbours. Also, the wind could be blowing from the opposite direction later. Less chance the anchor will foul. Less drifting out of position in case of crosswind. The anchor will often set earlier which means a greater distance from quay, maximising the scope . With the engine in reverse, the “prop walk” will steer the yacht to the left when looking at the intended spot on the quay . Yet, this is only the case when the engine is in reverse and not if it is in neutral. First make speed and counteract the prop walk as much as possible by putting the rudder at 45 degrees (more will only brake), then put the engine in neutral and the yacht will listen to the rudder normally. The crew on the foredeck should put a mild tension on the anchor line, while reversing, to help the anchor dig deeper. Not too much, since you would lose speed and also the anchor could break out. Near the quay there is an increased risk on lose lines, fishing nets and other rubble, so it is good practise not to use the prop the last few metres. Braking by feeding the anchor less line works better also helps the anchor set firmly. Orange came first, then green and you are blue! With one line on shore (windward one if cross wind), it is time to put pressure on the anchor: take anchor chain in till the catenary curve becomes more of a straight line. 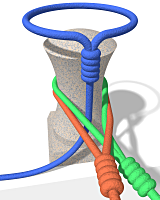 If after a while (sometimes immediately) the catenary curve reappears, your anchor has not set... by the time you have winched one third of the anchor line back on board, start considering a second attempt. So, during this whole Mediterranean mooring manoeuvre, not so much the helmsman but the foredeck is in control. Although it is a first a bit scary to steer backwards into a tight slot between two expensive yachts, speed keeps the yacht manoeuvrable. Tip: Plan to arrive early (typically before 15:00) at the port of destination so that there is ample space to manoeuvre and lots of berths at the quay to choose from.